Looking for love in all the wrong places? Here's a solution for you! The 2018 dating game: fierce and riveting yet crowded and stale. This is especially true for members of the LGBTQ+ community who are searching for meaningful connections on apps they can't identify with. As all of us swipe from one dating app to the next, one thing holds true -- the options not only seem endless, but they seem the same. Enter three people-meeting apps set on changing the dating game for everyone: girl, guy and anyone exploring their sexual identity. In what many would call a dream dating situation, one would attempt the ambitious plan of actually meeting someone IRL. BOUNCE touts itself as "where endless swiping ends." Truth be told, it's probably the most fun and most revolutionary way to hold yourself accountable to online dating. If ever you've wanted to meet someone online and be willing to go on a date on the spot, this app does exactly that. It completely removes flaking and incessant rescheduling efforts from the equation. (trybounce.com) The makers of Bounce say that their app is "for people who actually want to meet new people." 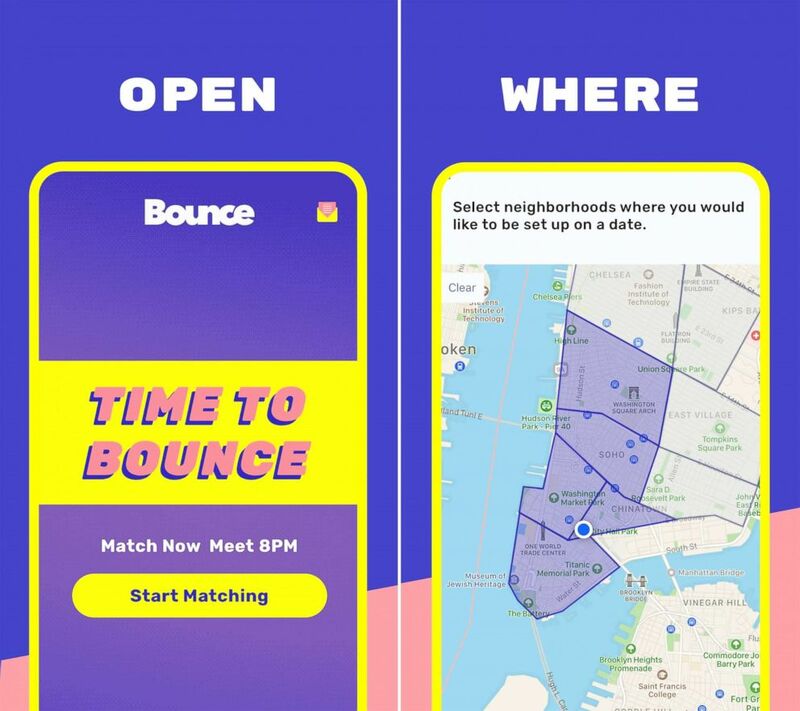 So here's the deal: BOUNCE tells everyone when to come onto the app to find a match -- no swiping for hours or days -- so everyone using the app signs on at the same time. The time even changes from day to day to shake it up even more. If you come across a match, then you have agree to go on a date that night at a time the app also specifies. If you don't go on the date, you lose said match ... forever. What? Yes. If you do, however, agree to meet for a date, the app chooses a location for you based on your two locations and what neighborhoods you've decided to search for matches in. All you have to do is say yes, from start to finish. The matching "sessions" are held once daily, for 15 minutes, so if you don't get a match in one session, you have to wait until the next day to try again. Part of the fun, too, is that you only have 60 seconds to swipe on someone before you're moved on to another potential match. Online dating accountability delivered with a twist: an actual date. According to BOUNCE Co-Founder Laura Petro, this app "is for anyone who is spontaneous, bold and wants dating to be a fun experience." She goes on to tell us the plight of swiping and chatting but never going on actual dates is what spurred on the creation of BOUNCE. What's more fascinating, Laura and her co-founders created a dating app with the intention of keeping people off of it. They instead wanted to create a means of meeting someone IRL and with no excuses. Open to anyone, gay or straight, it's available only in NYC right now but could bounce to a city near you very soon. From trans to queer to non-conforming, HER, more than anything, is rooted in creating community. 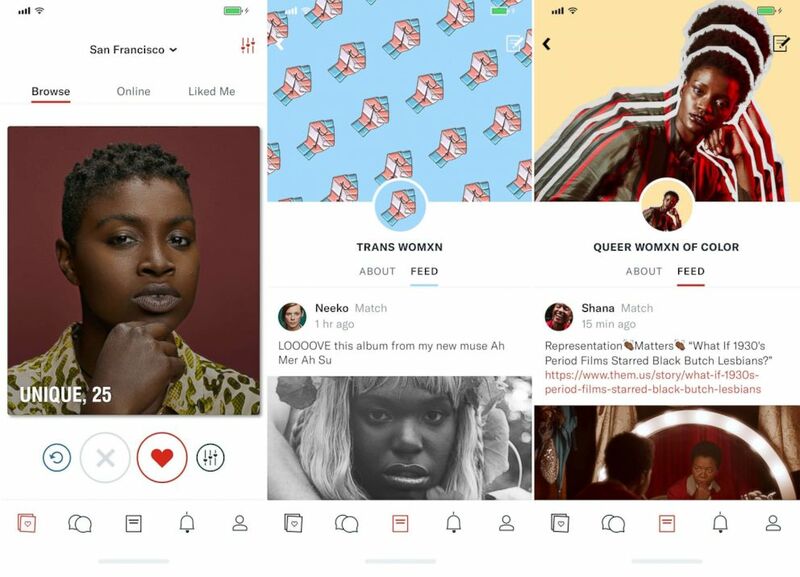 It's one of the first and most interesting platforms for LGBTQ+ people that puts "womxn" at the forefront of the app experience. HER Founder Robyn Exton describes being inspired by the gay dating app Grindr as it came onto the scene years ago: "It revolutionized the idea of gay men meeting other gay men; why couldn't there be a version for women?" 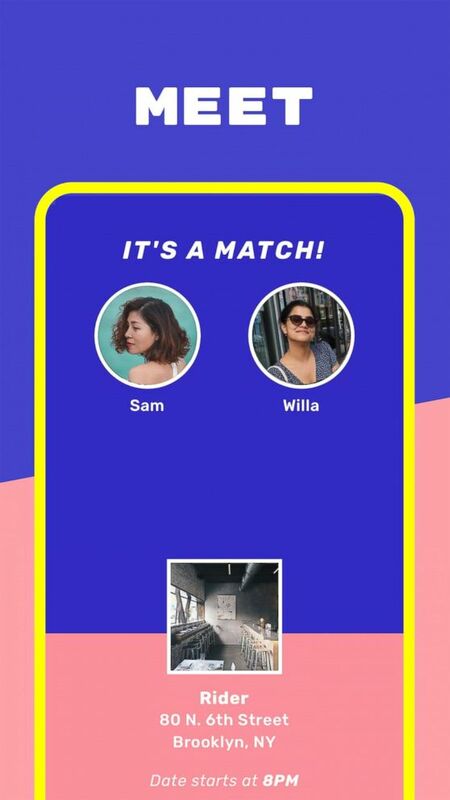 (weareher.com) The makers of Her say that the app is for profile-matching and community-making to connect 'womxn' and queer people. 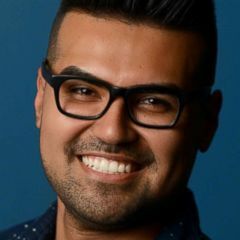 In a surprising turn, while creating an app geared toward women of all creeds, Robyn found that what was working for gay men on apps like Grindr was counter-intuitive and absolutely did not work for women. She found women were less likely to meet hurried and on-the-spot. Rather, women were looking for a deeper connection beyond the first profile photo. In her research, Robyn uncovered women also messaged more and more frequently than their guy-for-guy counterparts in online dating. HER was, in turn, created for the expressed need for women to find commonality with others just like them, setting them apart from any other sites or apps for queer people. A unique in-app component of HER that you'll see right away is the Group Community tab. "Strong & Single," "Trans Womxn," "40+ Community," the list goes on. 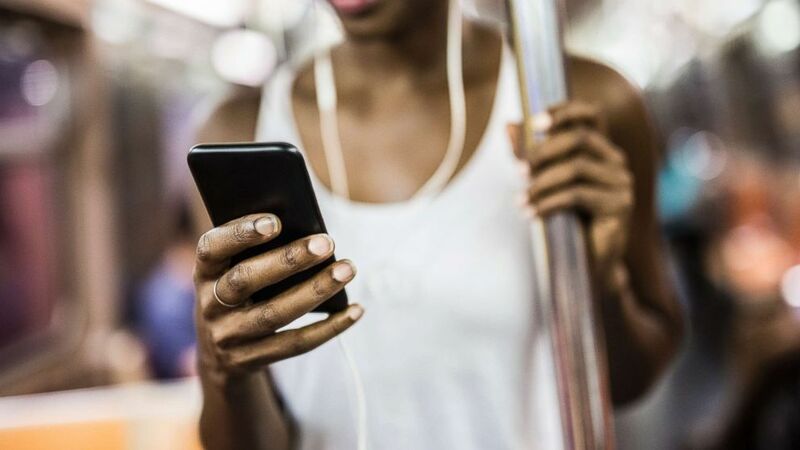 The creators and developers of the app go out of their way to list a wide range of communities to truly reflect their motto of supporting a "fearless exploration" for anyone who identifies with womanhood. Robyn tells us they "want users to feel proud, excited, and find a clear sense of community," and they seem to be spot on with what they are offering queer "womxn" everywhere. As for the use and reference to "Womxn" on their app and site, Robyn says they don't consider "assigned female at birth" as their definition of being a woman. To be free and separate, it represents what it means to be a womxn today: from trans to queer to non-conforming and exploring. It seems that gay men have the most options in the online dating market. In the end, most will say that the majority of them serve the same purpose of a hasty meet-up or hookup, and only occasionally have they led to meaningful connections. Sam Dumas, head of brand for CHAPPY, tells us the app was built on the idea that "kindness and respect should be synonymous with gay dating." The app is first and foremost secure, verifying all its profiles through Facebook, making genuine connections a real priority. Sam reiterates that authenticity is what makes CHAPPY stand out, adding that "the community deserves to date in a more transparent way." (ChappyApp.com) The makers of Chappy say that their mission is "to provide gay men with a safe, welcoming and high quality app for connecting and dating." 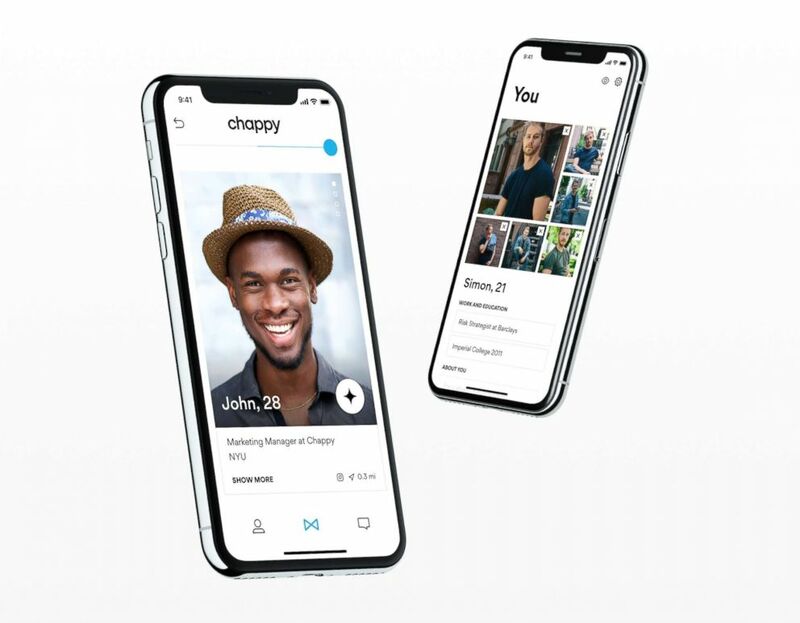 CHAPPY users can trade photos and communicate with one another only after they have matched, taking away the gay dating dramatics of the random and unsolicited message or photo. The key difference you'll find with CHAPPY compared with other apps is the ability to toggle between looking for "#MrRightNow," "#MrWhoKnows," and "#MrRight" with others who are also looking for the same thing at the same time. We're all guilty of that people-meeting mood that changes from time to time. The fact that you can toggle between your moods all in one place is certainly a game changer. Sam tells us he "wants guys to have conversations, go on some fun dates, get laid or meet someone that they want to be in a long term relationship with," and you can unquestionably do all of that with CHAPPY.